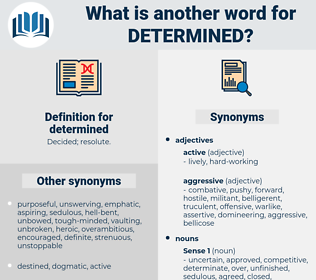 What is another word for determined? committed, calculated, single-minded, determines, determining, definite, deciding, specified, dedicated, strong, prescribed, determinative, undetermined, resolutely, steadfast, decide, Computed, settled, identified, willing, agreed, stated, determinable, Stipulated, insistent, identifies, ready, vigorous, considered, resolved, energetic, definitive, assertive, keen, given, listed, robust, forceful, dependent, adamant, determinate, Regarded, well-defined. limits, determines, determining, caveats, specified, determination, determinations, identified, resolved, determinate. redefined, Examined, demonstrate, delineated, confirmed, demonstrated, detected, Investigated, outlined, interpreted, reaffirmed, Detained, implemented, described, informed, initiated, dictated, verified, Indicated, directed, characterized, Rendered, Enshrined, Deemed, apportioned, deducted, Delivered, underlined, articulated, illustrated, Explained, arranged, uncovered, designed, apprehended, concluded, finalized, checked, promulgated, postponed, consolidated, governed, Managed, find, found, advised, enquired, addressed, Wrote, suggested, understood, conducted, recommended, ordered, Negotiated, distributed, Introduced, Testified, Chose, appointed, judges, Judged, ended, Told, Mentioned, retained, Audited, Participated, classified, revealed, ruled, elected, condition, allocated, Generated, imposed, admitted, Drafted, decree, decreed, Prosecuted, tested, reflected, acknowledged, finalised, Prompted, Influenced, Instituted, Undertook, Discussed, asserted, Obtained, learned, Insisted, Proceeded, Contended, notice, noticed, Caught, endorsed, earned, convicted, committed, disclosed, Tabulated, stressed, solved, treated, Contributed, perceived, highlighted, studied, permit, permitted, divided, recognized, included, forged, Commented, Were, maintained, acquired, Worked, drew, authorized, expressed, Resulted, assured, related, Upheld, conclusion, Cited, recorded, Enabled, realized, realised, involved, Began, withheld, adopted, arrest, arrested, opened, stopped, tracked, approved, drew-up, Dealt, Helped, granted, Weighed, Entered, controlled, executed, Achieved, lay, come, Came, elaborated, Reached, future, Erred, contained, satisfied, emphasized, struck, Encountered, Avoided, mounted, Performed, finished, Viewed, Brought, noted, sized, said, reasoned, pledged, Envisaged, expected, effected, moved, heard, exposed, put, assumed, brokered, wrapped, opted, unchanged, engaged, contracted, valued, affixed, Arrived, Awarded, expired, secured, Stood, pointed, Argued, Succeeded, alleged, Returned, started, sliced, Meant, won, led, added, Launched, saw, halted, formed, licence, Gained, Referred, showed, signed, broke, received, Scored, Voted, cracked, opinion, Occurred, Claimed, planned, busted, Caused, charged, Watched, Operated, Visited, quit, Gave, felt, experienced, Wished, changed, Fitted, Believed, Took, applied, used, released, Served, Had, Passed, wanted, held, placed, paid, called, Looked, Went, Allowed, accessed, thought, Got, made, welcomed, based, pulled, cut, specified, evaluated, decide, Computed, settled, identified, agreed, stated, Stipulated, estimate, considered, resolved, listed, Regarded. Examined, delineated, Administered, confirmed, demarcated, demonstrated, destined, detected, predicted, determinant, delimited, Inferred, Investigated, Denominated, outlined, quantified, organized, interpreted, Detained, implemented, Elucidated, described, validated, informed, guaranteed, initiated, Deduced, Approximated, analyzed, dictated, verified, nominated, Indicated, directed, quantitated, Termed, diagnosed, characterized, Rendered, Devised, detailed, located, Depended, jurisdiction, disciplined, clarified, judgment, Enshrined, parameters, Enumerated, mandated, Deemed, deducted, Eliminated, Convened, preparation, dominated, organised, Delivered, adjusted, combined, articulated, insured, formulated, illustrated, instructed, corrected, Explained, report, impacted, arranged, uncovered, Remedied, Attributed, designed, apprehended, triggered, concluded, characterised, substantiated, finalized, Constructed, checked, configured, consolidated, governed, written, Compiled, Managed, regulated, collected, Communicated, found, advised, induced, addressed, suggested, understood, Appraised, evidenced, removed, conducted, recommended, ordered, analysed, Negotiated, deferred, constrained, chosen, Introduced, terminated, Construed, anticipated, ensured, represented, appointed, Judged, prioritized, ended, Told, connected, reconciled, Mentioned, witnessed, mitigation, appreciated, Liquidated, affected, Translated, retained, desired, D, Audited, classified, revealed, Surveyed, ruled, gathered, Excluded, elected, devoted, conditioned, allocated, Enacted, restricted, entrusted, instalment, presented, Generated, contaminated, strengthened, incorporated, imposed, admitted, isolated, Drafted, entitled, decreed, Prosecuted, Accommodated, tested, Subordinated, immobilized, reflected, inspired, tailored, acknowledged, emit, finalised, redressed, bound, Inflicted, stabilized, Undertaken, unobstructed, Prompted, Influenced, traced, inscribed, Instituted, Discussed, asserted, adapted, Screened, Domiciled, Obtained, accumulated, embedded, pronounced, guide, guided, learned, cancelled, dissipated, shaped, Insisted, COSTED, judicata, documented, Commended, dissolved, justified, Contended, handled, notice, noticed, rectified, discontinued, Caught, Answered, ratified, endorsed, earned, Adjudged, Procured, Notified, fastened, convicted, committed, dismissed, tied, extended, disclosed, Tabulated, Embarked, hired, supported, stressed, solved, treated, localized, Contributed, pursuant, balanced, headquartered, Excavated, perceived, highlighted, studied, Reckoned, permitted, Confronted, initialled, sequestered, printed, Mapped, drawn, recognized, included, Hinged, forged, driven, Installed, maintained, precedence, solidarity, Aimed, acquired, Worked, Been, embodied, foreseen, Incurred, authorized, expressed, Ceased, Resulted, society, Gauged, structured, attained, assured, Begun, related, filled, forecast, forecasted, advertised, Upheld, conceived, rejected, intensified, Litigated, Cited, recorded, positioned, composed, fated, Enabled, realized, realised, involved, framed, read, increased, accomplished, Transferred, reduced, unsolved, Adjourned, spotted, withheld, adopted, arrested, Picked, crafted, authorised, opened, stopped, rooted, situated, help, labelled, sampled, projected, Worded, Underpinned, assembled, approved, priced, enrolled, Dealt, doomed, Helped, proposed, granted, Weighed, punished, Entered, controlled, bordered, executed, Gleaned, unsettled, Achieved, amount, come, elaborated, Prorated, Reached, implied, practised, wedded, overcome, needed, Enjoyed, contained, trained, Undergone, satisfied, emphasized, struck, Tackled, Arisen, Encountered, esteemed, Avoided, mounted, Performed, finished, Viewed, linked, Brought, noted, said, reasoned, Captured, pledged, Earmarked, Envisaged, Anchored, spent, scoped, Entailed, expected, contacted, cured, effected, geared, scaled, moved, Subjected, heard, egypt, exposed, put, assumed, Suffered, ranked, brokered, opted, poised, enclosed, practiced, Assayed, Persuaded, become, award, engaged, contracted, Filed, Followed, valued, affixed, sorted, published, Counted, vote, voting, Asked, Ascribed, headed, associated, Arrived, Lodged, Awarded, cast, expired, Died, preserved, Modelled, Waived, action, secured, bounded, pointed, marked, Argued, Emerged, Succeeded, Returned, advice, started, curve, faced, stuck, Supplied, raised, sliced, Meant, code, won, required, refer, spoken, Shown, led, added, Launched, Quoted, voiced, accrued, Averaged, halted, formed, Appeared, attended, pursued, joined, governor, Gained, Referred, showed, signed, locked, fixation, liked, received, Scored, severed, Voted, posted, sealed, Pegged, cracked, tabled, arms, Stationed, opinion, Occurred, Met, figured, surrounded, Sentenced, Claimed, role, requested, plan, Seemed, reference, seen, planned, busted, Evolved, Complied, obliged, Caused, charged, Carried, suited, posed, Operated, Visited, quit, Taxed, felt, experienced, changed, sought, run, Fitted, dosed, seated, shut, focussed, Believed, *, compounded, applied, covered, used, capped, leveraged, programme, left, released, Served, Had, Compromised, packaged, Passed, wanted, held, Accorded, Happened, kept, placed, paid, packed, failed, taken, played, called, Looked, let, gone, backed, Allowed, dated, accessed, Acted, Housed, thought, Gotten, Got, made, welcomed, based, cut, named, Accounted, calculated, specified, dedicated, evaluated, prescribed, determinative, Computed, settled, identified, agreed, stated, Stipulated, considered, resolved, given, listed, Regarded. hesitating, flexible, vacillating, irresolute, yielding, weak, indefinite, unfixed, undecided, changeable, soft, wavering. gentle, teachable, obliging, slack, ambitionless, hesitant, unambitious, impotent, indecisive, complaisant, amenable, compliant, docile, dutiful, softening, reluctant, submissive, tractable, faltering, obedient, mistrustful, slackening. He determined to wait no longer. I'm just determined you're to have that scholarship! drowned, deerhound, deterrent, drum out, durum wheat, deodourant, dairymaid, determent, dethronement, drawn-out, drained, dormant, deodorant, doormat, darned, death warrant, detriment, deer hunt, determinant, determinate, drumhead, dry mouth, durante, dreamed, drown out, dry unit, durant.